Market Street Bridge serves as a major link across the Santa Ana River for the residential and commercial communities in the northwestern Riverside County and the neighboring Cities of Jurupa Valley, Riverside, Colton, and the County of San Bernardino. Market Street, which is designated as an Arterial Highway in the Riverside County’s General Plan, serves as part of an alternate local route connecting Freeway I-10 and SR-60. The existing bridge is a 12-span steel plate girder structure with a total length of 1195 ft. 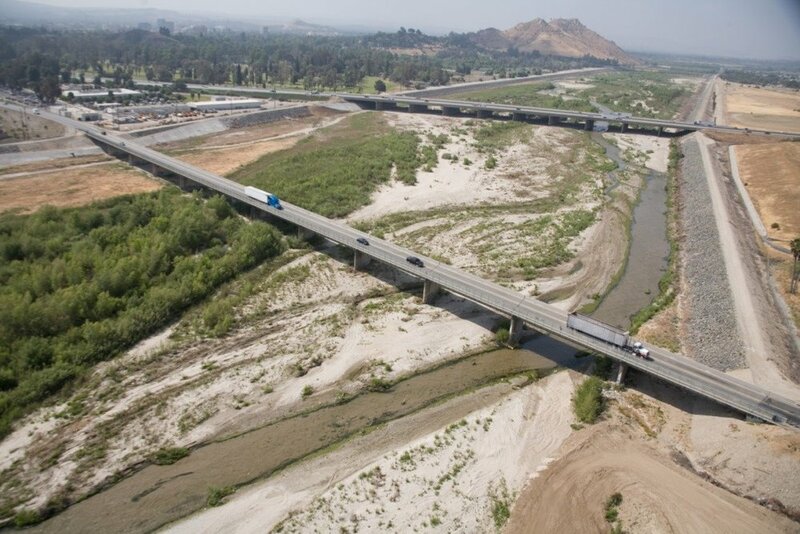 It is 33’-8” wide and carries two-lanes of traffic over the Santa Ana River (1‑lane in each direction). There is a sidewalk along the north side separated from the vehicular traffic with a concrete barrier. This bridge was constructed on reinforced concrete pier walls, which are supported on driven concrete piles. The existing bridge was constructed in 1953 and seismically upgraded/retrofitted in 2001. The 2001 seismic upgrade work is now outdated and insufficient in consideration of the current Caltrans Seismic Design Criteria and retrofit technology. The bridge is listed in the federal Eligible Bridge List (EBL) with a status flag of "Structurally Deficient" (SD) and a Sufficiency Rating (SR) of 45.1. Since the bridge is rated "SD" with a SR lower than 50, the bridge is eligible for total replacement using federal Highway Bridge Program (HBP) funds. The structure is also considered functionally obsolete due to its deficient curb-to curb roadway width with no room for shoulders. The purpose of the proposed project is to replace the existing structurally deficient and functionally obsolete 65 year old bridge with a new 4-lane bridge to provide enhanced public safety and traffic circulation in the area. The work will include reconstructing approach roadways, providing necessary channel improvements, and a multi-purpose trail connecting to the existing and proposed regional trails. · Designated: Structurally Deficient (SD).